joint the GMH2 user discussion on facebook ! A script to help users to convert/edit polygon hair to Maya Hair or generating next-gen polygon hair strips easily. User can easily model complex hair styles using traditional polygon modeling method and convert to Maya Hair using GMH2 with 2 simple steps. 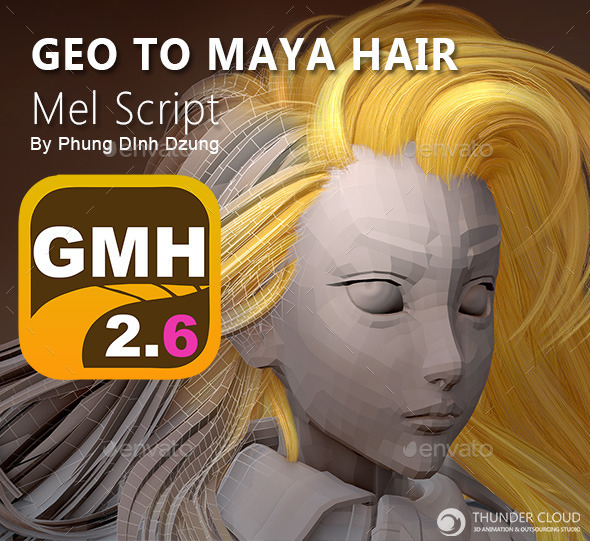 Unlike the older version GMH, GMH2 can convert polygon to Maya hair with just 1 single click nice and clean. latest version 2.6 features include the option to bake hair to textures on polygon planes, a material manager for applying multiple shaders to hair geometry, and the option to export hair in OBJ or FBX format as curves or poly meshes. For Linux and Mac OS, There will be a slightly change in the UI of GMH2 as Maya’sMel for Mac/Linux doesnt support button with Images.